This teeny-tiny article needs some work. You can help us by expanding it. 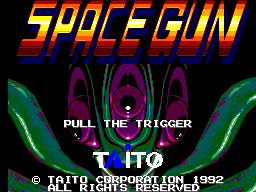 Space Gun is a 1990 light gun arcade game developed and published by Taito. It was subsequently brought to a variety of home systems including the Sega Master System in 1992. As expected, the Master System version of the game relies on the Light Phaser. The objective is to shoot as many aliens as possible without harming the humans or allowing yourself to be killed. The weaker hardware of the Master System version means huge cutbacks are made to the game, with most of the pseudo-3D effects, digitized voices and two-player support dropped.